Home › Blog › Menopause – Is It All In Your Head? Menopause – Is It All In Your Head? We've heard Dr. Zava call it the "angel of life, and the angel of death." Too much can be hazardous. Too little can be problematic also. Not many people realize this, but estrogen plays a role in more bodily functions than just reproduction. In fact, estrogen has many important functions in the brain. Studies show that decreasing levels of estrogen can cause two of the most common perimenopause symptoms – hot flashes and mood fluctuations. Curious how this happens? Read on to learn the details of this biochemistry. The main focus of this blog is the time in a woman’s life right before menopause, conveniently called perimenopause. The difference between menopause and perimenopause is fairly straightforward – menopause is the time after periods stop happening, and perimenopause is the time leading up to cessation of menstruation. Perimenopause can start as early as 10 years before periods stop for good (more commonly though, it’s 2-4 years). The symptoms many women experience during perimenopause include hot flashes, mood instability, changes in memory, and menstrual cycle irregularity. All of these symptoms are brought on by decreasing hormone levels – estrogen and progesterone. Previously thought to be only involved in reproduction, estrogen has many important functions in the brain. For example, estrogen ensures there is enough energy for optimal brain function, promotes brain cell survival, and protects it from damage. The blog highlights the changes that take place in the brain with decreasing estrogen during perimenopause, and how these brain changes present themselves in the form of mood fluctuations and hot flashes. Specifically, when there is not enough estrogen in the brain, changes arise in how the brain uses glucose – its main fuel; and in neurotransmitter functioning – the main chemical messengers that relay information within the brain and the rest of the body. 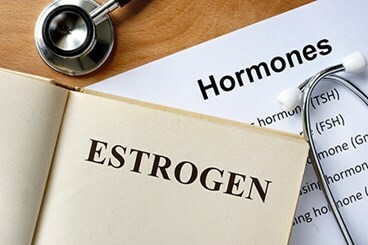 Supporting evidence is also presented in favor of hormone replacement therapy to support optimal estrogen levels in hopes of decreasing the risk of developing diseases like Alzheimer’s. And the short answer to the question in the title is – yes. It pretty much is. Menopause concludes the reproductive chapter in the feminine life cycle. Women’s cultural beliefs and practices contribute to the considerable variance in individual perceptions of the experience. Although the details of each menopause story are unique, the essence of physiological transformations is not. Defined retrospectively as the cessation of spontaneous menses, menopause is characterized by diminished ovarian production of estrogen and progesterone and termination of production of oocytes, resulting in reproductive senescence. Some experts regard perimenopause as a time of great vulnerability during which an increased risk of neurological decline can emerge for a substantial proportion of women. Fluctuations in reproductive hormones define the dynamic period of a woman’s life, called perimenopause, in which the first endocrine, biological, and clinical features of impending menopause begin. Unlike puberty, when hormones strive to rev up to a constant hum by short, intense, and dramatic spikes, in perimenopause these same hormones increase and decrease slowly, with a gradual and overall effect of winding down. More specifically, perimenopause encompasses three stages: the early menopausal transition, marked by persistent cycle irregularity; the late menopausal transition, with intervals of amenorrhea of ≥60 days; and early postmenopause – the first year following the final menstrual period. After 12 months of amenorrhea, perimenopause culminates in menopause itself. Persistent changes in hormone levels give rise to unrelenting systemic consequences. The core symptoms of the menopausal transition are vasomotor, including hot flashes, night sweats, and sleep disturbances; and somatic, such as vaginal dryness and atrophy. With an average duration of about 4 years, the onset of distressing symptoms may happen as early as 10 years before termination of menstruation. The frequency and severity of these symptoms appear to peak in late perimenopause and early post-menopause. Additionally, some experts regard perimenopause as a time of great vulnerability during which an increased risk of neurological decline can emerge for a substantial proportion of women. In clinical terms, perimenopause initiates a systematic and targeted disassembly cascade of the reproductive system. Although the classical definition focuses mainly on the reproductive system, perimenopause is fundamentally neurological in nature. The breadth of neurological symptoms associated with perimenopause, such as mood changes, insomnia, decreasing cognitive function, and temperature dysregulation, suggest a disruption of centrally-regulated mechanisms. The ovarian hormones estrogen and progesterone, which are essential reproductive and neural substrates, are at the heart of this transition. This blog is going to primarily focus on estrogen in the context of perimenopausal symptomatology. Operating synergistically with many biological systems, estradiol belongs to the complex gonadal hormone family that regulates a myriad of physiological functions. Previously thought to be restricted to its reproductive role in the periphery, more recently the pivotal actions of estradiol have been shown to extend to higher cognitive functions such as mood, motor coordination, and pain sensitivity. Estradiol coordinates signaling and transcriptional pathways that govern energy metabolism in the brain. Specific neuroprotective actions of estradiol that are essential to neuronal health include estradiol’s role as a potent antioxidant, and its involvement in the regulation of glucose transport and aerobic glycolysis, modulation of mitochondrial function and generation of ATP, and promotion of cell survival. Changes in the organization of the estrogen receptor network within the brain or alterations of circulating estradiol levels can elicit profound consequences on neural circuit function. The ovarian-neural estrogen axis modulates a myriad of neurological processes via a network of estrogen receptors. 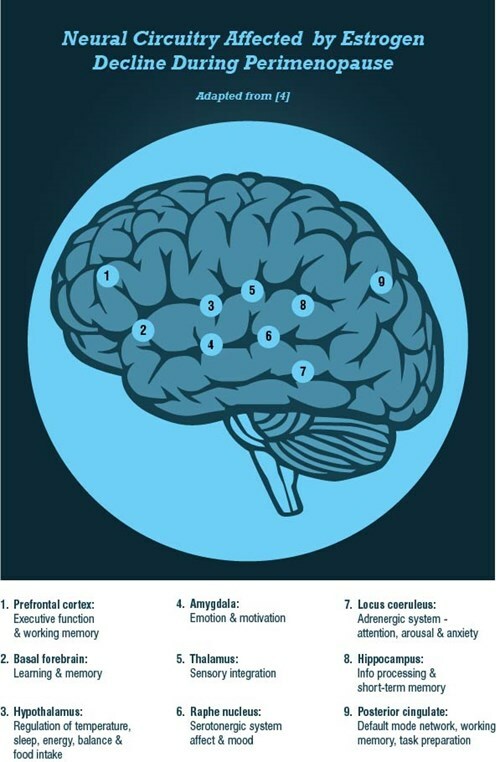 The locations of estrogen receptors in the brain coincide with the relevant neuroanatomical regions that regulate executive and affective functions, and vasomotor stability. Estradiol signaling via the estrogen receptors ensures that the brain effectively responds to stimuli in a timely fashion, and that neurons generate sufficient energy to meet demand. Changes in the organization of the estrogen receptor network within the brain or alterations of circulating estradiol levels can elicit profound consequences on neural circuit function. One such example of a functional consequence of decreasing estradiol levels is perimenopause, when the estrogen receptor network undergoes uncoupling from the bioenergetics system, giving rise to a hypometabolic state associated with neurological dysfunction. Some experts present convincing evidence that hypometabolic states are intimately linked with vasomotor and mood symptoms in perimenopause. Experienced by approximately 80% of women during perimenopause, hot flashes commonly co-occur with other neurological symptoms, such as sleep disturbances, mood changes, pain, and decline in cognitive function. Characterized by the onset of intense and troublesome rises in body temperature, hot flashes are complex and poorly understood. Increasing evidence suggests a tight-knit relationship between hot flashes and impaired glucose homeostasis. Glucose levels and the degree of insulin resistance correlate with frequency of hot flashes. Furthermore, fluctuating levels of estradiol coincide with a decline in brain bioenergetics and shift towards a metabolically compromised phenotype, an effect that can be rescued with hormone replacement therapy (HRT). In symptomatic female patients receiving HRT during perimenopause, glucose metabolism is preserved in brain regions with estrogen-dependent neurological functions, an effect not observed in symptomatic patients without HRT. The connection between glucose metabolism and mood disorders is multifaceted. Substantial changes in brain bioenergetics may also be linked to the development of depression. Postmenopausal women with depression display hypometabolism in the pons and hypermetabolism in the frontal gyrus, compared to postmenopausal women without depression. As women approach menopause, fluctuations in ovarian function have a profound impact not only on the hormonal milieu, but on neurotransmitter levels and signaling as well. Estradiol directly modulates neurotransmitter systems – activates receptors, upregulates neurotransmitter biosynthesis and release, and blocks re-uptake and degradation, and modulates overall structural morphology of many brain regions. In their turn, neurotransmitters (norepinephrine and serotonin) directly regulate the thermoneutral zone – the homeostatic range of body temperature. Compression of the hypothalamic, cortical, and subcortical thermoneutral zones leads to episodic releases of heat in response to slight increases in the core body temperature. As estradiol declines, brain norepinephrine levels increase, thus inducing a narrowing of the thermoneutral zone. Additionally, decreased estradiol consequently results in upregulation of monoamine oxidase-A (MAO-A) levels in the brain - the enzyme responsible for degradation of serotonin. In neurochemical terms, as estradiol decreases, serotonin turnover is increased. Serotonin is a potent thermoregulatory agent that modulates hot flashes in an opposite manner from norepinephrine. Therefore, putatively reduced serotonin function during perimenopause and an abundance of norepinephrine signaling appear to have vasomotor manifestations in the context of a declining hormonal environment. With regard to cognition and mood, administration of transdermal estradiol reverses the heightened emotional activation and reduced activation of working memory with acute tryptophan depletion in menopausal women. This and other studies further highlight and support the magnitude of positive effects estrogen has on cognition and mood via modulation of serotonergic function. Perimenopause is a developmental change in the evolving landscape of endocrine and neurological transformations. As the estrogen network uncouples from the bioenergetics system, a hypometabolic state associated with neurological dysfunction may arise. Additionally, the declining trajectory of estradiol-dependent events precipitates variations in the dynamics of the monoamine neurotransmitter system. The new neuroendocrine environment of perimenopause characterized by continuous change may render some women vulnerable to neurodegenerative disorders late in life. Multiple conditions emerging during perimenopause such as insomnia, depression, memory impairment, and cognitive decline may be associated with an increased risk for dementia, including Alzheimer’s disease. Following completion of the perimenopausal transition, the neurological system reaches a new homeostatic domain. Notably, for some women, intervention is not necessary; however, for others intervention is appropriate and may alleviate distressing symptomatology. Hormone replacement therapy serves as the logical choice, given the tremendous impact that estradiol elicits on the brain. Timing of the administration of HRT appears to be critical to the effectiveness of the therapeutic approach, with perimenopause providing the optimal window of opportunity for introducing exogenous hormones. Personalizing HRT may be the best strategy for each individual patient to sustain neurological bioenergetic capacity. Whatever intervention path is decided on by the provider and patient, the main goal should focus on sustaining healthy brain function. A balanced brain is the foundation for optimal physical, psychological, and emotional well-being.